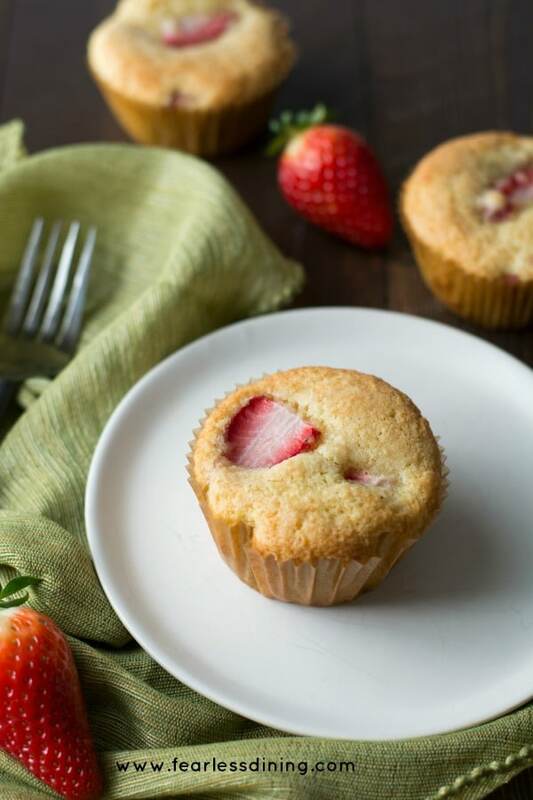 Gluten free strawberry muffins are so light and fluffy, your family will beg you to make more! 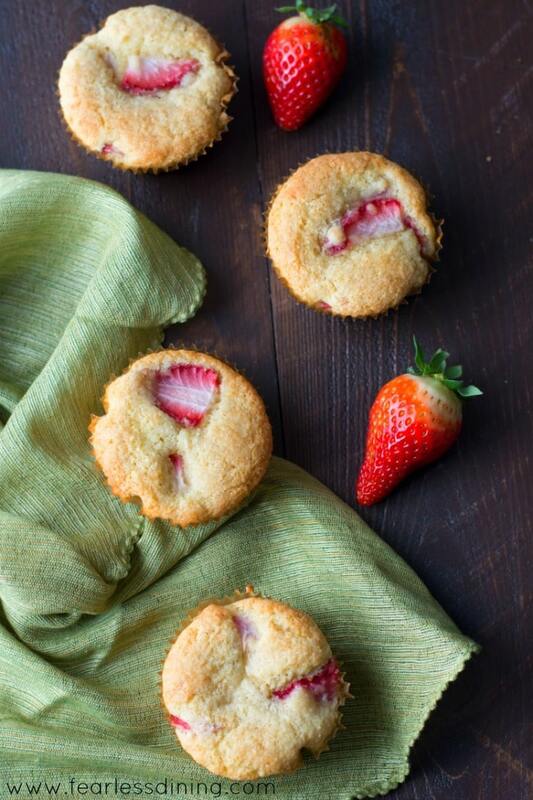 Your best bet is to make a double batch of the gluten free strawberry muffins recipe. Oh, and I have a gluten free diet tip: this is the only gluten free muffins recipe you will EVER need! Just substitute your favorite fruit, chocolate chips, nuts, or anything you like to create a custom muffin recipe you will love. I was at the farmer’s market last weekend and I couldn’t resist buying a case of these big, fresh, and juicy organic strawberries. The way I calculate things…I get three baskets and my kids get the other three. Just to make sure they don’t cheat and eat my “recipe” strawberries, I put them in a container and hid it. While making the second batch of the gluten free strawberry muffins recipe, I made a fun recipe video so you can follow along. If you have been reading my blog for awhile, you know I love to use almond flour in my baking as a way to add some protein to my baked goods. Anthony’s sent me their certified gluten free almond flour to try out. I can’t say enough good things about this almond flour. I have used their flour before, and honestly, I tend to use a few different ones depending on sale prices…but Anthony’s is fabulous. 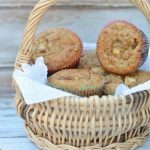 The almond flour is so finely ground that these muffins are not gritty or lumpy…just light, and delicious. Here are two more delicious muffin recipes using almond flour for you to try! Gluten Free Healthy Blackberry Muffins and Gluten Free Peanut Butter Muffins. 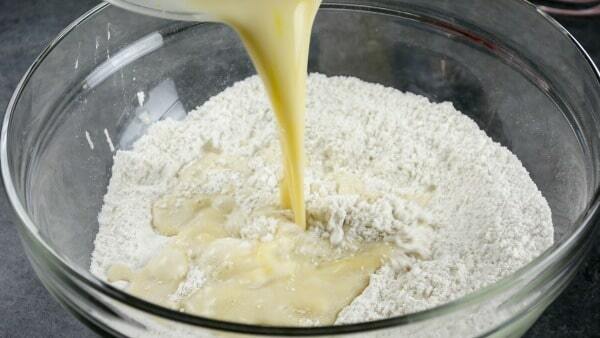 Pour the wet ingredients into the dry ingredients and mix very lightly. See my tip below. 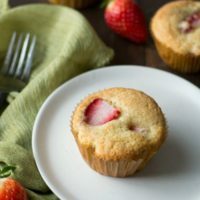 Can I use other fruits in this gluten free muffins recipe? The secret to light and fluffy muffins is to barely mix your batter. 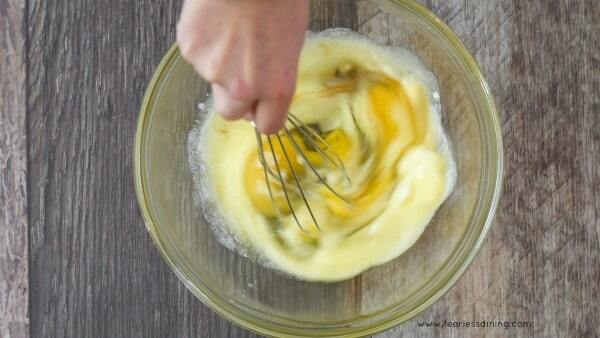 Overmixing deflates the air that mixes in and can make your muffins a lot denser. 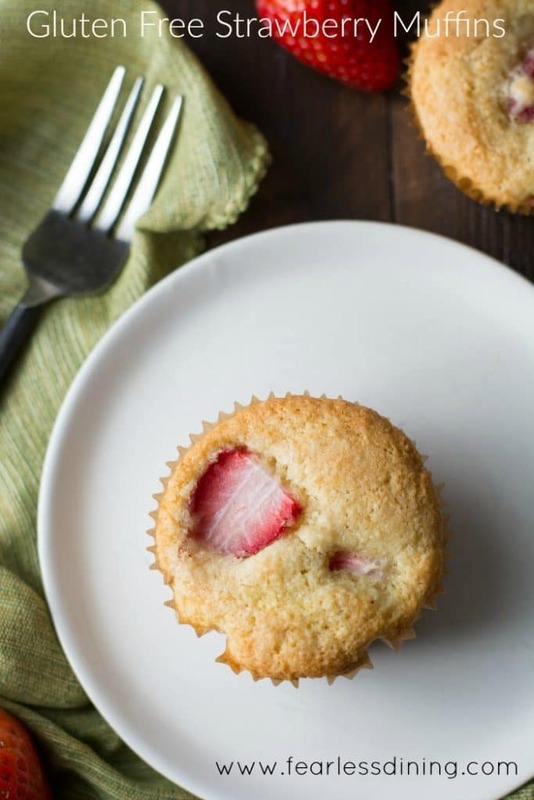 You need this light and fluffy gluten free strawberry muffins recipe in your life!! Easy to make and delicious. Watch our recipe video instructions, too. Mix lightly until it is just blended. This will make your muffins light and fluffy. Put paper liners into a muffin tin. Fill each cup 3/4 to the top with batter. More Yummy Muffins to Try! Loved them with the strawberries, today I am using fresh blueberries! I am so glad you loved this recipe Nacy. I bet these muffins were amazing with blueberries! The first time I made these muffins I followed the recipe exactly as written. They were perfect. Since then I have made them with frozen blueberries, raspberries, and sweet cherries. I did not thaw the fruit so they do take a little longer to bake but each time they have turned out light fluffy and scrumptious! Thanks for a wonderful recipe!! Hi Lori, you don’t need almond flour, I would replace the 3/4 almond flour with 1/4 cup additional flour and maybe 2 tablespoons flaxseed meal. I haven’t tested that, but you can judge by the batter and how thick it is. You may need to play a little with the proportions. Good luck and please come back and let us know how it turns out. I am so glad you liked them Gloria. They are delicious with other fruits as well :-). I just made these today for my little one. She loved them! I adjusted a few things in the recipe. I added less GF flour blend (1/2 cup), an extra 1/4 cup almond flour, and for the rest of the flour I used coconut flour, I used Coconut oil instead of butter and use birch xylitol as the sweetener. Okay, maybe a lot of adjustments, but I am trying to do more clean carbs/paleo-ish/low sugar. I did end up having to use double+ water called for and double the cook time. Thank you for providing all these recipes. I look forward to trying more. Hi Brandi, Thank you so much for writing in. 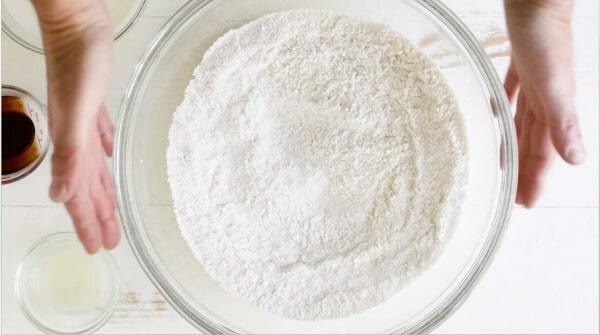 Coconut flour needs a LOT of moisture, so that makes sense that you would need to double the water quantity. I would love for you to comment back and let us know your measurements. I am sure a lot of my readers would love to make these even healthier as you did. Thank you so much for writing. Have a great weekend. that turned out like you promised, light and fluffy. I am so glad you like these Barb 🙂 I really appreciate your writing, you made my day. Have a nice day. I made these for my brother cause he can’t have gluten….he absolutely loves them! I love baking with fresh fruit! This sounds like a perfect muffin for my husband’s breakfasts! These look so perfect for spring breakfast and brunches! this recipe looks delicious!! I’m excited to try almond flour! Love the video Sandi! And these muffins sound fantastic! Thank you Sharon…I still have a lot to learn and my YouTube issue with the music is still pending. This looks yummy! Perfect way to start a busy day! I was just at a strawberry farm yesterday and have a fridge full of ’em! These muffins are on the menu for tomorrow! I am so jealous Trish…that sounds like so much fun. Nicely done on the video, Sandi! 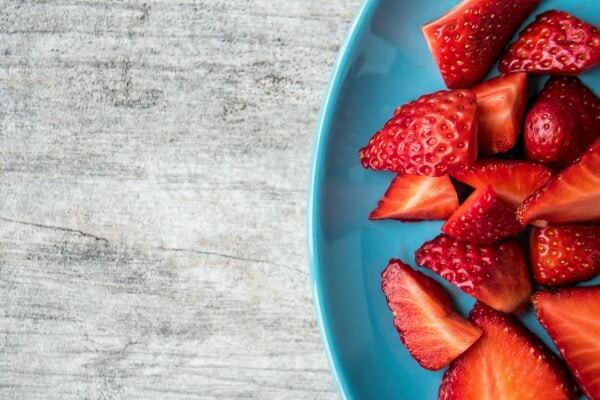 I’ve been totally crazy for strawberries lately too. These look so delicious! Thank you Trish…it is a learning process.